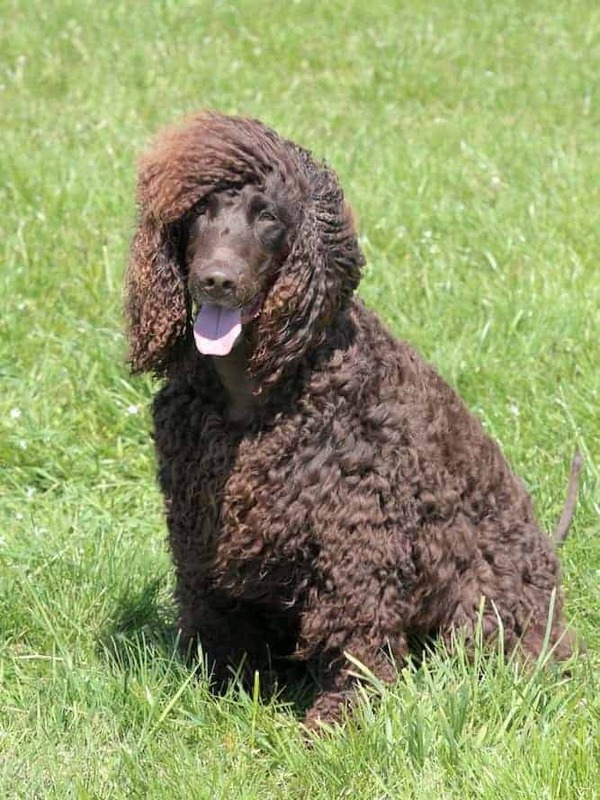 Irish Water Spaniel Temperament: Ready for A Curious, Intelligent, Clown? The Irish Water Spaniel temperament is playful, brave, and hardworking. They are said to have an ancient history – even dating back to the Stone or Bronze age. However, while there might have been dogs that looked like the Irish Water Spaniel throughout time, their actual origin is unknown. The purebred Irish Water Spaniel is a recent development. Bred as a water retriever, the Irish Water Spaniel is a rarity today. The Irish Water Spaniel breed is known for their clownish behavior. They have a seemingly permanent smile and love to make their humans laugh. Irish Water Spaniel’s do everything with enthusiasm! Irish Water Spaniels are first and foremost hunting dogs. They are extremely smart, bold, and curious. While those make for an interesting breed, they aren’t the best qualities for first-time or inexperienced dog owners. Irish Water Spaniels are loyal to their family, but they aren’t always welcoming of strangers. They are alert, which makes them great watchdogs, but they are not known for their barking. Unless raised together, Irish Water Spaniels don’t always get along with other dogs or cats. The Irish Water Spaniel does do well with older, well-mannered children. They may be too large and rambunctious for younger children. Irish Water Spaniels are too large and need too much space to live in an apartment. They do best in a home with a large, fenced-in backyard. Although they have a willful streak, Irish Water Spaniels can be easy to train – for the right owner. Irish Water Spaniels love a mental challenge. They are quick learners but enjoy putting their own spin on what you are trying to teach. They can be stubborn, but if you find out what motivates them – such as treats, praise, or play – you’ll get results. Only use positive reinforcement when training an Irish Water Spaniel. Keep their training sessions fun and light as they love to think they are playing a game. Early socialization will help an Irish Water Spaniel puppy grow into a well-mannered adult. Since they can be wary of strangers, frequent socialization will also help teach them to accept new people. Often mistaken for the Portuguese Water Dog or Spanish Water Dog, the Irish Water Spaniel is a bit larger. They weigh between 45 and 70 pounds and stand between 21 and 24 inches tall. Irish Water Spaniel’s can live up to 13 years. Irish Water Spaniels have a double coat – meaning they have a top coat and an undercoat. They have tight ringlets on their back and sides with longer, wavy hair. Their tail is one of their most striking features. It is wide where the tail meets the body and tapers into a fine point at the end. Irish Water Spaniels are always a solid liver color (also known as a deep, reddish brown). They hardly ever shed but need to be brushed two or three times per week to prevent matting or tangling. Irish Water Spaniels have floppy ears and are prone to ear infections. Clean and dry their ears every time they go swimming or get wet. Follow this step by step guide to successfully groom your Irish Water Spaniel. The above is a lot but don't let that scare you from pursuing an Irish Water Spaniel. Just make sure you are prepared to spot and handle potential health issues before they become a major problem for you and your dog. The Ultimate Guide to Dog Health will save you time, and money. Get a copy to keep at home. 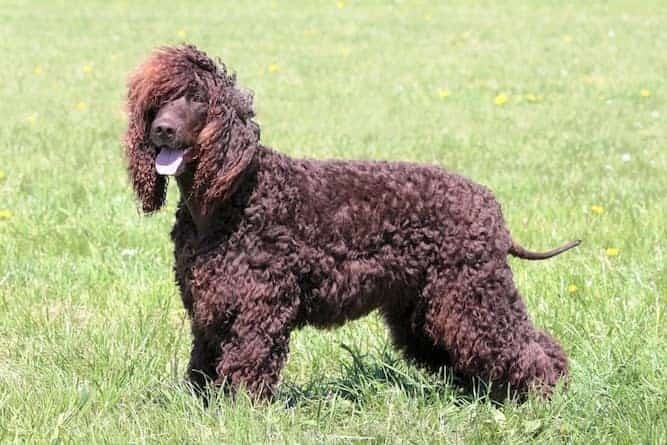 The Irish Water Spaniel is an active breed that needs a lot of activity. Unsurprisingly, the Irish Water Spaniel loves water. They will love nothing more than weekly (or daily) swims in the pool or nearby lake. Irish Water Spaniel’s get hyper and destructive if they don’t get enough exercise. In fact, it is known that exercise can work wonders for bad behaving dogs. They make excellent hunting dogs thanks to their incredible stamina and reliable tracking abilities. 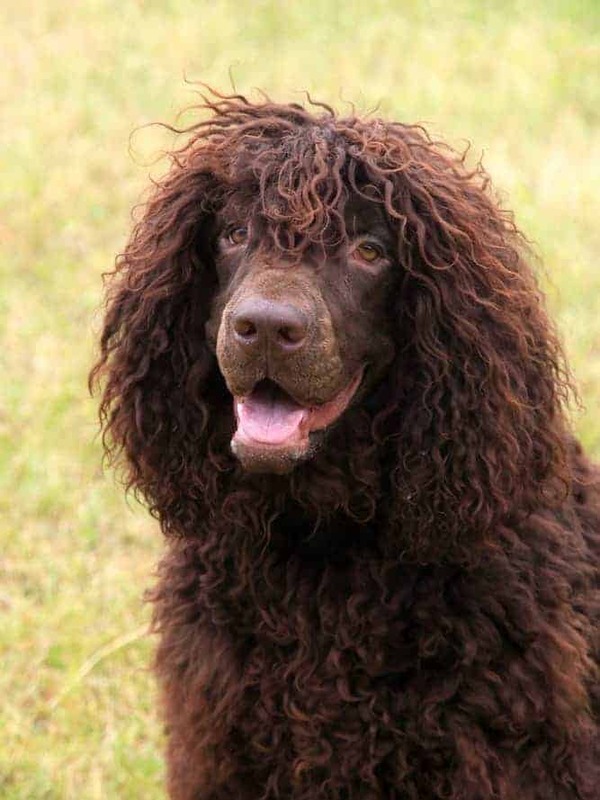 Before you dive into finding your perfect Irish Water Spaniel, consider your lifestyle. Are you able to handle adding a puppy to your family? Will you have time to dedicate to a puppy? If not, an adult Irish Water Spaniel from a rescue may be the better option. They are typically already housetrained and know basic commands. Begin your search with the Irish Water Spaniel Club of America. You can find information on Irish Water Spaniel breeders as well as Irish Water Spaniel rescue information. The average cost for Irish Water Spaniel puppies for sale is between $800 and $1000. The Irish Water Spaniel price is dependent on several factors such as location, litter availability, and lineage. The Irish Water Spaniel Club of America is a great resource for questions regarding Irish Water Spaniel rescue. They have a list of common questions about rescue dogs such as, “Are all rescued Irish Water Spaniel ‘problem’ dogs?” (Spoiler – they’re not!). Additionally, they answer questions about meeting the dog prior to committing or what happens if it doesn’t work out. An Irish Water Spaniel for sale from a breeder is a great route if you are looking for a purebred puppy or for a puppy with a superior lineage. A great resource for finding an Irish Water Spaniel puppy is the American Kennel Club Marketplace. Not only do they have a breeder registry, they also provide information on the breed. The Irish Water Spaniel is the perfect dog for experienced owners. They are personable, smart, and energetic. Though intelligent, Irish Water Spaniels can be stubborn and willful but will respond to positive reinforcement training. Irish Water Spaniels love to swim and will easily be your best friend if you live near a lake or pool. You’ll always be laughing with an Irish Water Spaniel – their zest for life is infectious!